We all know the age-old wisdom – An apple a day keeps the doctor away, but now the new research suggests that it can keep the trichologist (hair doctor) away too. 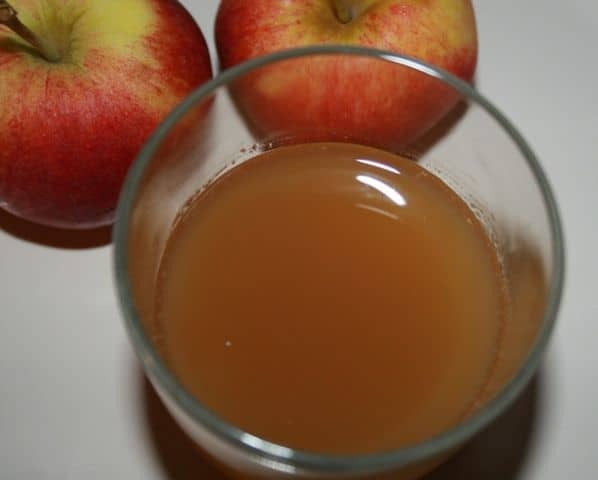 Apple juice is the hidden ace of hair care, and it works wonders for your scalp and hair. It helps with dandruff and itchy scalp, balances the scalp’s ph, and makes your hair shiny, silky and manageable. Here’s how apple juice can help you get beautiful hair..
Apple contains malic acid, an alpha hydroxy acid, which works as an exfoliant and emollient to remove dry dead skin covering the scalp. Regular treatment with apple juice will help slough away the dead skin, dandruff flakes, leaving you with a fresh clean scalp and hair. The acidity of the juice removes product buildup and other gunky residues from your hair. The apple juice also works by closing the cuticle (outer layer of the hair), giving your hair a smooth finish. When used regularly in your natural hair care routine, apple juice treatment will make your hair super soft and boost your hair’s body and shine. The scalp has a pH between 4.5 and 5.5. This means that our scalp and hair is the healthiest when the pH is on acidic side. This natural hair acidity hinders the growth of bacteria and fungus, and keeps our scalp and hair in good health. Many of the hair products that we use disrupts the skin and hair’s natural pH levels. Apple juice hair rinse will help maintain your hair’s natural pH balance. You can use apple juice by itself, but I prefer to dilute it with some warm water. Try both ways – with and without water- and see what works better for you. Extract the juice of 1 apple, to it add 1 cup of warm water (For some unknown reason I have found better results using warm water than cold or room temperature water). Use this as a final rinse after shampooing your hair. After shampooing, slowly pour the apple juice mix onto your scalp and massage it in. Leave in for 5 to 10 mins and wash out with tepid or room temperature water. No need to use conditioner. Apple juice will leave hair feeling smooth and silky. 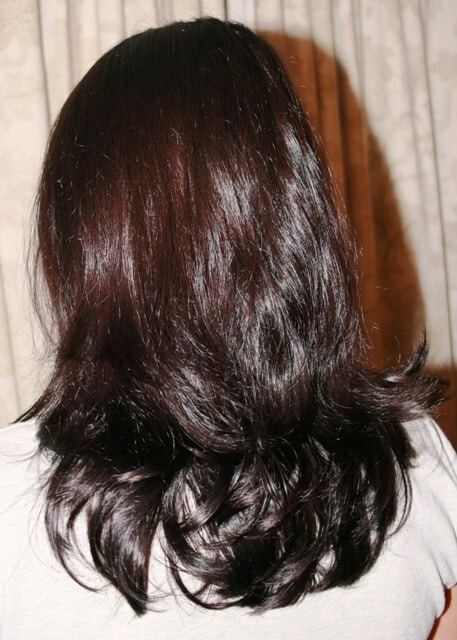 After towel drying take about 5 drops of coconut oil or olive oil and apply to the lower 2/3rd of your hair. This will make your hair more manageable and also easier to comb through. For dandruff: Use this rinse every other day for a week after shampooing. It should provide notable relief from itchiness and flakes after two or three uses. After the first week, you should only have to use it once a week. Just after the first use you will notice a stunning effect of this revitalizing hair treatment. Apple is also great for your skin. Do not throw the apple pulp instead make a face or body scrub out of it. Add some sugar and oat meal or fullers earth (multani mitti) and your scrub is ready. This scrub has a skin brightening effect. The malic acid in the apple works to remove the dead skin, making skin smoother and reducing the look of fine lines. Have you tried apple juice on your hair? Do share your views in the comments..
Hi Arjoo, you can use apple juice once or twice a week. That’s superb. Thanks for sharing your experience. hi, I tried apple juice on my hair. It works wonders. Dandruff eliminated within a couple of days. hair looks more vibrant. Kiran, that’s fantastic, thanks for sharing. im sorry but how do i extract the juice of an apple? I read about apple cider vinegar being a good hair rinse after shampoo. Is apple cider vinegar good for hair?